The two boys represented here could very well be the mythical Hehe Erxian twins who are symbolic of harmony and happiness, and were a popular subject-matter in Chinese art for their mischievous yet endearing countenances. The pomegranate, which is one of the 'Three Abundances', is a symbol of fertility, as its numerous seeds are likened to having many children. Together, the pomegranate and the heavenly twins, form an auspicious image of happiness and fecundity, reinforced by the presence of the ruyi which translates as "as you wish". 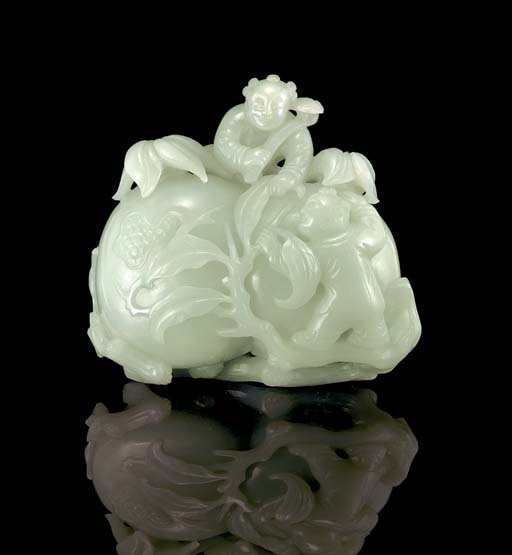 For a comparable jade group, see James Watt, Chinese Jades from Han to Ch'ing, New York, 1980, p. 110, no. 94.